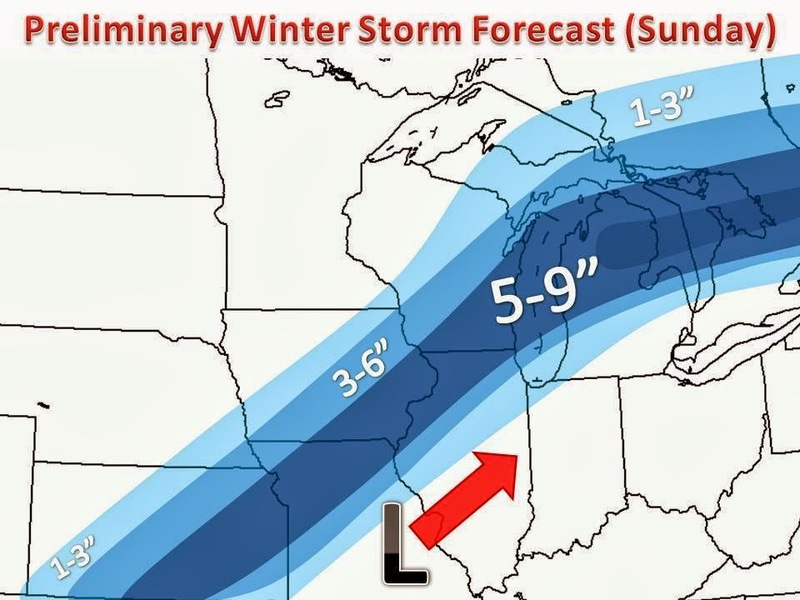 We are starting to close in on the main event, the expansive winter storm for the Midwest. We have been tracking this system for 6+ days now, and confidence is finally considerably high on the track and snow amount of this storm. Winter storm watches have already been issued from Nebraska to Green Bay. The main story will be the snow here, but a major severe weather outbreak will occur this weekend in the deep south, demonstrating the strength of this low pressure system! Storm Summary: A major ridge has developed in the Southern Rockies, with a strong split flow in place. This feature is very conducive to winter storms in our area. With this pattern in place, a strong surface low pressure will develop near Texas and race northeast into northern Indiana by Sunday, dropping significant snows on the back side of the system in a stretched out deformation zone (classic to such a winter storm). Forecast: The heaviest snow amounts still appear to be on the order of 5-9" with locally higher amount. Some models are actually hinting at a foot of snow in some spot, but whether that materializes will depend on whetehr or not we can get the severe thunderstorms to rotate back into the cold, and fall as all snow. One thing I would like to mention, is the the exact track and exact location of the axis of heavy snow is not set in stone (although were are fairly confident) the 5-9" band is subject to a north or south shift by 10-30 miles. So stay tuned for updates!